Home News THRIVING IN THEOLOGY! Lauren Toner picks up second place in Chester University Religious Studies Essay Writing Competition. 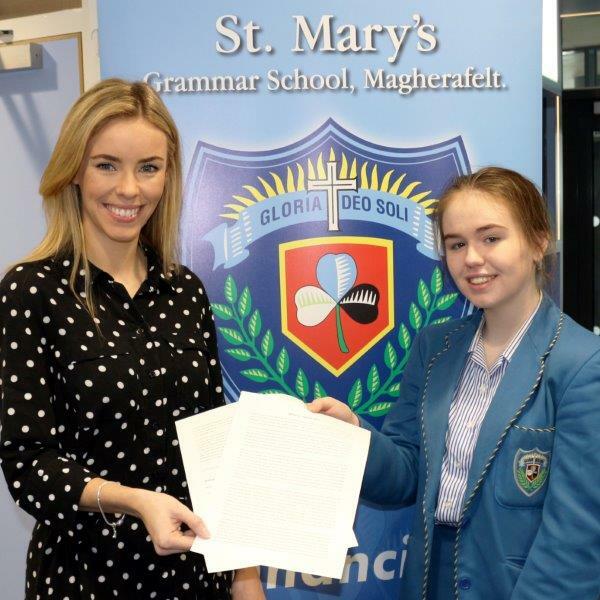 Year 13 Religious Studies pupil, Lauren Toner, has been awarded second place in the prestigious Chester University Theology essay-writing competition. Miss Burn’s, Head of RE. pictured with Lauren Toner. “Lauren made excellent points and drew on a range of sources very effectively.” Dr. Wendy Dossett. The Theology and Religious Studies Department at the University of Chester has been ranked joint first in the sector, which serves to highlight further this outstanding achievement. Congratulations, Lauren.